I had a dream about a month ago. Clear as day I had a vision of my mother in a hospital after surgery and I was taking care of her. I woke Jesse to tell him about my dream. Unlike normal dreams, this is one I refer to as a preparation dream. During the dream I felt strong and calm. As if I understood this is supposed to be, or planned rather. A week later my mother called telling me about a mouse-sized growth in her throat, and that she was making an appointment to get it checked out. The biopsy was benign, and a five-hour surgery took place yesterday. Everything turned out well, but she has some recovery ahead of her. As I sit in the hospital keeping vigil, these cookies remind me of her and of my own childhood. Every Christmas she would pull out the waffle iron as far back as I can remember, and make these magical cookies. Magical to me at least. To a little foodie, cookies in a waffle iron were something special, and much different than the Toll House Chocolate Chip ones she would make on other occasions. These cookies provide me with visual reminders of our kitchen in our split-level orange home in College Place, Washington. There was a chocolate brown refrigerator that I often yanked open to peer inside for snacks when I was bored or hungry. Attached to the kitchen was the main dining area where Mom kept a bookcase stuffed full of her many cookbooks. I would pull them down, rummaging through 1960s and 1970s Better Homes and Gardens looking at the pictures even before I could read. Maybe this is where my passion for food and photography began now that I think about it. In college I realized that I wanted to someday be good enough to copy historical images. I needed to understand the concepts of art as well as master the technical side of photography before I could even think of trying. I also realized that I would have to work differently with light, composition, and Photoshop to come close to producing the same qualities that certain films created. I wasn’t sure I could do this, but I did try. Somehow, the top shot has the qualities of a dying Andy Warholesque time; ridged, uncomfortable, structured. Too shiny, and not screaming out that this is food. More art than not, it needs a macramé plant holder to accompany it. Or maybe a few random figurines! The bottom shot is a more modern look; warm, casual, unstructured, and much like you wouldn’t disrupt the scene if you snatched a cookie for yourself. I remember my mother always used canned frosting. She loves canned frosting. I myself am not so fond of the stuff, unless it’s on these cookies, as the canned version somehow magically stays soft, probably from all the chemicals in it. Although, I have been known to make my own chocolate frosting to smear over the top. My mom will get better, and I realize there are moments where she will need me, as I needed her when I was younger and will likely need her again. It’s all part of this pretty darn wonderful life, and I feel strong, protective, and brave enough to face forward. 1. Preheat Belgian waffle maker. 2. In a stand mixer or with a hand mixer, cream together butter, sugar and salt. Then beat in eggs until well incorporated. Mix in cocoa powder and vanilla extract. Then add the flour and mix until just combined. 3. With a standard (size 50) cookie scoop, scoop the dough and drop onto the hot waffle iron onto the sections. Cook 90 seconds per waffle. Carefully remove the hot waffle from the iron with a spatula to a cooling rack. 4. Once cooled, frost with chocolate frosting as desired. Or as I do, eat them sans frosting. Recipe from Linda Komberec. Pictures by Laura Flowers. Oh my gosh, I hope your mom will be alright and recover quickly. So nice that you have this waffle memory to share with us. I'm so happy your mother's surgery is over and that you can relax and enjoy the holidays as she recovers. Life can throw you a curve ball when you least expect it! My grandmother made these cookies and they brought back an instant memory when I saw your picture. Thank you. I hope your mom recovers quickly. 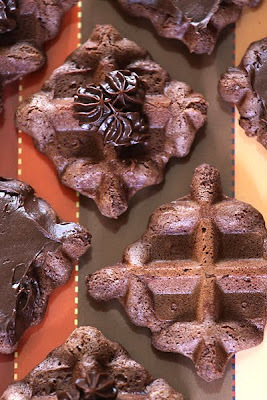 These waffle cookies look delightful. I hope your mom is well. What a delsih way to transform waffles into cookies. You have a yummy blog and brilliant photos. Have fun cooking and baking! Oh Laura - I'm so sorry to hear about your mom, but so glad to hear she'll be okay. I wish for a very speedy recovery to her!!! Now, on to your adorable cookies - I love them! I like to make waffles like them - not enough batter to reach the edges. Pizzelles too. I think they look so interesting. PS - I'm with you and can't stand canned frosting. May I suggest you try ganache some time? It stays soft unless you refrigerate it, and the flavor is out of this world! I am grateful that after I read your post.. I could read the positive optimistic follow up here..I am so happy it was benign..and that although there is some recuperation needed.. the prognosis is A-1. I love nostalgia..and memory lane. You brought me down your lane and I loved my walk. Happy Happy Holidays to you..you ahve soo much to be grateful for!And I hope to see you the whole year through.. Wish your mom great health..happiness and all the canned frosting she wants from a little fellow blogger in Canada. sounds like you got an early xmas present? my thoughts are with you and your mom and to a speedy recovery.....or they will be, as soon as I stop thinking about those amazing waffle cookies! Your post was lovely. I enjoyed taking a sentimental journey through your childhood food nostaligia. I can relate to thumbing through cookbooks, I did too. In fact, I really developed a fondness for the recipe cards that became popular in the 70's. I am so glad to hear that your mom is doing good. 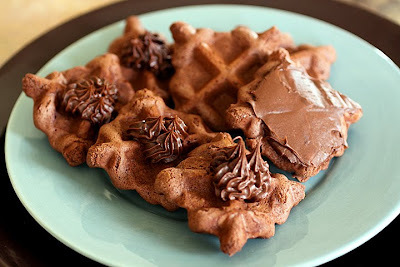 I think you should both make a batch of these wonderful waffle cookies together, when she is feeling better. Firt, I hope you mom is on the mend soon! These cookies look great. Merry Christmas. Happy to hear your Moms surgery went well. Now the canned frosting is only in an emergency like if there is not any chocolate in the house and not a cookie or piece of cake. Then I take out my mini spoon and take some and hide the can at the back of the fridge:) It takes the edge off of my craving and keeps me from getting violent:) Now those waffle cookies are unique. I'm glad to hear that your mom is recovering. What a beautiful, optimistic post! Cookies in a waffle iron? I've never heard of that before, and they look very tasty! Now I'll need to get a waffle iron. I used to make waffle cookies a long time ago. Thanks for reminding me of them. These cookies do look magical, and original! I have never seen such cookies:) YUM! What a great memory of your mom and her awesome cookies. These look good and they're so unique. I'm glad to hear that your mom is recovering well. Have a great holiday! So happy to hear that you mom's sugery had a good outcome. What wonderful story, glad that you shared both your memory and your recipe. Best wishes to your mom. She is doing well having you with her. Your writing is a joy to read. Your cookbook will do really well. I can't wait, and I'm not even a foodie. Best wishes to you and your mom for a super speedy recovery. Really loved how you described both shots, great to gain some understanding of the photographer's thought processes. Wishing I had a waffle iron right now, the cookies look wonderful with all those ridges. I wish your Mom will be fully recovered before Christmas! That would be a very wonderful gift for everyone in your family. By the way, nice recipe! It is my first time to actually see choco waffle cookies. So glad to hear your Mom is doing well, my prayers will be with her. What a wonderful daughter you are! Recipe looks delicious! wow! this recipe is great! i really love it! i'm your new follower happy to discover great tips for cooking and lovely pictures here! I can't imagine how scary that was! I am very close with my mom. I love that you made a recipe from your childhood to bring you close to her. Those look so delicious. Hi Justyna, I'm glad to have you!! Thank-you everyone for the well wishes. Laura, wish your mother all the best, hope she gets better soon. And I looooved your cookies, really gorgeous!! Hope your Mom feels better soon laura. Gosh, what a dream. Love these waffle cookies, andlove the connections with them. What a great post, Laura. I'm glad to hear that your mom is done with the surgery and recovering. You're amazing to have reacted to the dream the way you did and to be so strong still. As for the cookies, I've been waiting ever since you put up the photo and I'm even more excited about them now. The clean lines of the top photo do appeal to a side of me, but I agree the bottom one is more inviting. I've never heard of waffle cookies before. I've only ever used my waffle iron for waffles. These look very yummy! I like the first photograph too. Nice lighting. Btw, missed you at the holiday party on Friday! Laura, I am just catching up on my favorite blogs during crazy time of the year. I hope your mom is recuperating well. This must have been scary for all. I have a friend going through exactly the same thing. She just had the surgery and is slowly getting better. Your love for your mother and life's reflections and memories are touching. We can only hope we have given our own children such strength through our normal everyday lives....page by page. Happiest of Holidays for you and your family. Just read this Laura - best wishes to your mum, and hope she makes a speedy recovery. I made these today and we all loved them. Then I heard the neighbor had delivered her baby boy and was coming home today so some made it over there. The kids say we need to keep this recipe forever. Thank you. Thank-you for making this recipe. It's an emotional one for me certainly. I'm glad your family will use it now as well. I like the recipe, it looks really delicious, moms really know the best :) Love the shots by the way. Rolled Gingerbread Cookies, A Very Old Recipe.